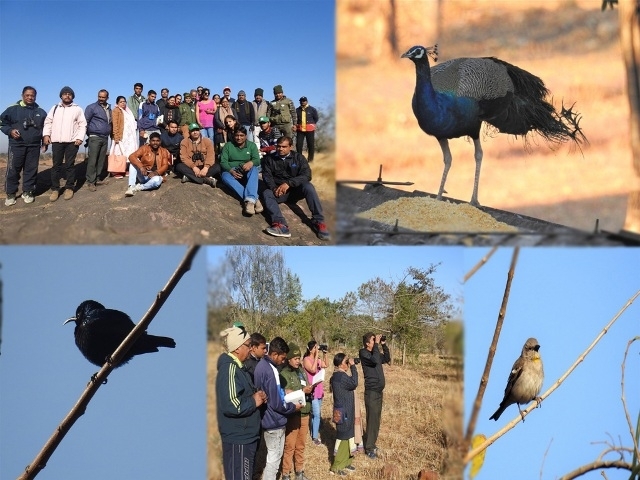 Indira Gandhi Rashtriya Manav Sangrahalaya, Bhopal organized "Bird Walk"
Bhopal: On the occasion of Vasant Panchami, Indira Gandhi Rashtriya Manav Sangrahalaya, Bhopal organized "Bird Walk" with the collaboration of Bhopal Bird Conservation Society. The members of Bhopal Birds Conservation Society and visitors joined the walk. This walk started from 7 am at the coastal village open air exhibition, IGRMS and concluded at 10 am in Rock art heritage open air exhibition. In this walk, the information about the bird's philosophy, his name and specialty given by founder member & moderator of the programme of the Bird Conservation Society, Mohammad Khalique , Dr. Sangeeta Rajgir and Dilsher Khan to the registered participants and during the programme, participants identified nearly 50 species of birds mainly in the form of Copper smith barbet, Black red start, Purple sunbird, Red vented bulbul, Laughing dove, Jungle babbler, Yellow throated sparrow, Tailor bird, Indian robin, Barn swallow. On this occasion, Program Coordinator, Dr. P. Shankar Rao (Assistant Keeper) IGRMS) stressed on promoting biodiversity in campus so that IGRMS camps will attract more migratory & local birds. Further he said that, "We aim to develop and maintain conducive atmosphere with biodiversity in Campus. It has nice green cover and water bodies which are like paradise for migratory & local birds. It is our effort to make our campus for bird lovers."